Fart | Hvilket land tror du har verdens nest kjappeste internetthastighet? 35 petabytes og 27 millioner nedlastinger fra 224 land senere har Pando Networks målt internetthastighet i alle kriker og kroker av denne kloden. Kina er nummer 82 i verden, USA er 26. Vinneren, Sør Korea, har verdens hurtigste hastighet. Faktisk raskere enn UK, Tyrkia, Spania og Australia – tilsammen. Romania, Bulgaria, Litauen og Latvia er alle topp 5. Sverige og Danmark slår oss. I Congo kan ikke lyden av et modem ikke være langt unna. 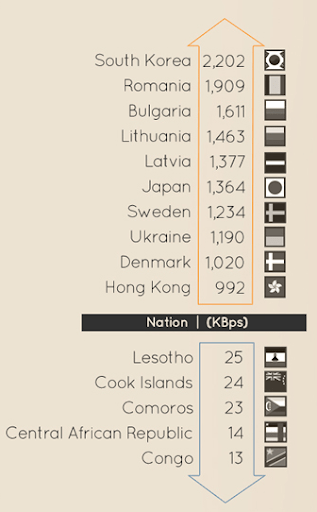 Norge har en hastighet på 802 KBps, og er akkurat utenfor topp 10. Hvordan hai angriper internett. Nei, seriøst. Hai. “The Internet is a series of tubes,” the late Sen. Ted Stevens infamously rem<rked in a 2006 speech on net neutrality. The quote quickly went viral, harshly mocked by the “Daily Show” and dozens of amateur YouTube users. Only 10 percent of Internet traffic currently moves through satellites. So this actually is a pretty good map of how most of the Internet’s data travels: through more than a half-million miles of privately owned, three-inch thick, submarine cables (and, once those hit land, above-ground cables). Sometimes, the tubes that carry the Internet break. The causes can range from natural disruptions — an undersea earthquake, for example — to ship anchors digging up cables. The most common problem is fishing nets dragging cables up, although the cables have also had to fend off sharks (shark bites cause damage to Internet cables every year, according to the International Cable Protection Committee). Serious damage can break the tubes; a 2006 underwater earthquake off the coast of Taiwan, for example, brought service there to a screeching halt. There is actually a whole fleet of ships dedicated to fixing the Internet’s damaged cables. Popular Mechanics wrote a fascinating story about them a few years ago. The ships use sonar, video cameras and a multimillion-dollar remotely operated vehicle affectionately named “The Beast” to locate and fix damaged cables. So, the late Sen. Stevens was pretty accurate in describing the Internet as a series of tubes — and probably among the most important and best-cared-for tubes out there. Jeg likte denne. Ikke noe man leser hver dag. What has the Internet Done for the Economy?, Kellogg Insight: …There is widespread optimism among media commentators and policy makers that the Internet erases geographic and socioeconomic boundaries. The Death of Distance and The World Is Flat, two books that espouse that rosy view, were bestsellers. But in the early days of the Internet, the income gap between the upper and middle classes actually began to grow. ‘We thought it was just a very natural question to ask: is the Internet responsible?’ Greenstein says. The researchers studied trends from 1995 to 2000 in several large sets of data, including the Quarterly Census of Employment and Wages—which gives county-level information on average weekly wages and employment—and the Harte Hanks Market Intelligence Computer Intelligence Technology Database, which holds survey information about how firms use the Internet. In total, the researchers included relevant data for nearly 87,000 private companies with more than 100 employees each. Based on their older work, they focused only on advanced Internet technologies. Out of about 3,000 counties in the U.S., in only 163 did business adoption of Internet technologies correlate with wage and employment growth, the study found. All of these counties had populations above 150,000 and were in the top quarter of income and education levels before 1995. Between 1995 and 2000, they showed a 28 percent average increase in wages, compared with a 20 percent increase in other counties (Figure 1). Figure 1. Advanced Internet investment and wage growth by county type. Why did the Internet make such big waves in these few areas? Greenstein believes the reason was that these areas already had sophisticated companies and the communications infrastructure needed to seize on the Internet’s opportunities. But there are other possibilities. The impact could have been due to a well-known phenomenon called ‘biased technical change,’ which means that new technologies can thrive only in places with skilled workers who know how to use them. Or it could have been because cities brought certain advantages—denser labor markets, better communication, tougher competition—than more remote areas.